In the desert, water is life. Arizona’s remaining perennial rivers and streams are precious water resources that deserve protection.The Arizona Water Sentinels program is a grassroots, hands-on conservation program of the Sierra Club - Grand Canyon Chapter that has mobilized volunteers to protect, improve, and restore our waters through hands-on conservation work, public education, and citizen action since 2006. Our Sentinels work throughout the state, with a current focus on the Verde and San Pedro rivers, where we monitor water quality conditions, and the Rio Salado Habitat Restoration Area in Phoenix, where we conduct monthly weed-and-clean events to protect this important riparian area. 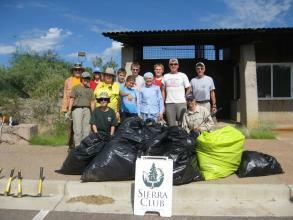 We also organize stream clean-ups on several waterways across Arizona. The primary mission of the Water Sentinels program is two-fold: hands-on conservation work that educates and engages the public through volunteerism. Water Sentinels are citizen scientists and advocates who volunteer because they care deeply about a local stream, or they’ve seen too many Arizona rivers reduced to bone-dry washes through impoundments, diversions, and groundwater pumping, or have witnessed their degradation by pollution and want to do something about it. Water Sentinels perform water quality monitoring, flow monitoring, invasive plant eradication, and stream clean-up projects to protect and restore Arizona’s unique and irreplaceable riparian areas. You can conserve water and support the Water Sentinels by joining the Water Sentinels C2E Program. By participating in Water Sentinels C2E, you will learn simple tips to reduce your water use, and your efforts will result in direct benefits for the environment in your community. Using your Water Use Dashboard, you can track your water use over time, learn about where you have the most potential to save, and put your water savings to work to support Water Sentinels! See the "How C2E Works" and "Know Your Water" tabs above to learn about the program and simple things you can do to save water. Click the blue "Join Program" button to get started today!